For the EACOP project we will ensure that potential effects on the health, safety, and security of communities, workers and the environment, are addressed and managed throughout the planning, construction, and operational phases of the project. We are committed to comply with national laws and international best practices, including International Finance Corporation (IFC) Performance Standards (PS). We have selected the proposed pipeline route over a number of years after comprehensive feasibility studies directed at avoiding environmentally and socially sensitive areas such as protected areas and areas of high population density. Our Front End Engineering Design (FEED) and ongoing Environmental and Social Impact Assessment (ESIA) will ensure that temporary and permanent facilities are carefully located. The pipeline and facilities will be constructed and operated to reduce potential adverse environmental and social impacts and maximize benefits. At the EACOP Project, we are diligently working to develop a complete understanding of the diverse environment and social elements along the proposed pipeline route. We have various teams of environmental and social experts collecting baseline data that will be used to inform the ESIA, design and construction of the pipeline. As part of the ESIA, the project is conducting a human rights impact assessment (HRIA) to identify potential effects on human rights associated with project activities. As a result of this study, we will understand what mitigation is required to minimize potential impacts through all project phases. The ESIA is being completed by both national and international consultants. The studies will result in the development of robust environmental and social management plans that will guide the design, construction and operations of the EACOP project. ESIA stands for Environmental & Social Impact Assessment. 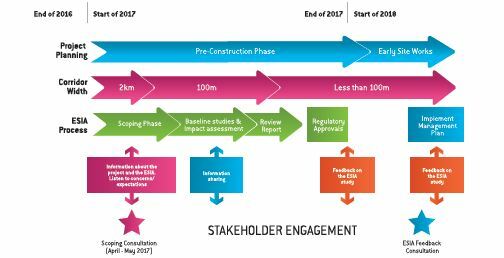 It is the process that defines and evaluates the potential social and environmental impacts of a given project and their mitigation measures. The ESIA studies for the EACOP will be conducted around the crude oil export pipeline route (from Kabaale – Hoima in Uganda to Chongoleani peninsula, north to Tanga port in Tanzania) and the storage terminal (in Chongoleani). The studies will be conducted in accordance with the international guidelines, as well as laws of both the Ugandan and Tanzanian Governments. When is An ESIA done? All your comments will be written down and taken into account. The reports will be submitted to the government of Uganda and Tanzania for their approval. Only after their approval can the project go ahead .All the proposed management measures in the reports will have to be executed.